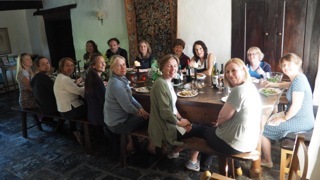 What do you get if you place fifteen writers in a rural melting pot, simmer for 5 days with the occasional stir from a tutor and serve on a bed of literary aspiration? Answer, an Arvon creative writing course. 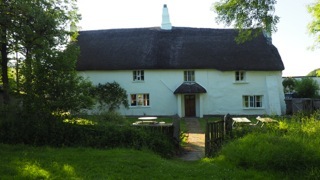 We earnest scribblers, or more appropriately key-tappers, from as far afield as Switzerland and the US, congregated at the remote idyll Totleigh Barton in the depths of Devonshire. Wifi/phone access required a significant uphill walk and frenetic mobile waving to obtain a signal. Any observers would think we resembled Star Trek crew members on a reconnaissance mission. But this didn’t faze (or phase?!) us as we focused our efforts on writing in our monastic-style rooms. But I’m getting ahead of myself. Initially apprehensive yet hopeful we gathered for the first evening’s activities. After formalities we jumped into the ice breaker: everyone had to state three facts about themselves, the twist being one statement had to be untrue. Aside from revealing the effective liars, it was an early indication of writing style: from terse action sequences to fairy tale weaving. Our motley crew of fourteen women and one undaunted man was comprised of those with related careers such as literary festival organiser or children’s librarian, some members with writing MA experience, and some with simple enthusiasm. But the common thread was the desire to write Children/YA novels. By the end of day 2 we’d all had a one-to-one with Gillian Cross or Marcus Sedgewick, both award winning authors. Later we sat entranced as they read extracts from their books and discussed their literary backgrounds. On the third day, after much further pounding of the keyboard, and another mentoring session, it was my team’s turn to make the evening meal. We narrowly averted a disaster to a huge vat of chilli con carne when my ageing eyes initially read tablespoons of spice instead of teaspoons in the farmhouse kitchen’s gloom. The camaraderie of cooking, eating and much washing up (the dish washer was broken) was followed by our guest author Emma Carroll’s reading and talk. It was fascinating to compare the three authors’ publication experiences: Long-standing writer Gillian Cross had approached a publisher directly, Marcus Sedgewick worked for a children’s publisher before finding an agent, Emma Carroll was ‘discovered’ when successful in her MA course. Although they acknowledged they couldn’t help with advice about conventional routes to agents, their input concerning our work was invaluable, rendered broader due to their different approaches: detailed critique versus overview. After we’d spent the fourth day beavering away at our lap-tops, with the occasional sortie into the beautiful gardens and rural surroundings, we appreciated our evening down-time. Considering our target readership, it was unsurprising that our by now socially cohesive group reverted to childhood with party games. We giggled uncontrollably, not wholly due to the quantities of wine imbibed. 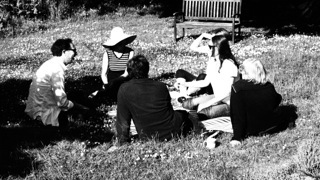 The final full day held the last tutor meeting and the first chance to hear excerpts of each other’s work. Some were more serious, topics ranging from a feral child to teenage love. But there was also the earthy humour so appreciated by school boys: a poem about farts followed by a piece about a pigeon squadron called the B-fifty-poo bombers. The following morning we were subdued by our imminent departure but heartened by our learning experiences. We’ve exchanged email addresses so hope to keep all informed of event news, recommended books and, dare I say, publishing successes. What did I take away from the course? Minor tips such as how to improve titles (don’t use personal names: passé), avoid comic book phrases, instead letting the verb do the work (‘She was startled’ rather than ‘Aargh’), and steering clear of brackets! More major adjustments concerned pacing, tightening the narrative by asking myself: what is the purpose of this chapter? and plot suggestions, for example considering the ending then working back from that. The crunch point, sadly, is that my first book, Cat’s Eyes, where my teenage heroine overcomes the loss of her sister through helping a life-threatened alien, may have to be set aside as a mere learning exercise, and not become the début roaring success I hoped it would be! But there’s promise in one of the alternative novels I’ve embarked upon. The general consensus was that Poppy’s adventures with sidekick Albert the eccentric talking cat could hit the publishing spot. Perhaps I should leave you to decide. Feedback welcome.